This entry was posted in Africa, Australia, Copenhagen, Laos, Panorama, Photo, Photography, Thailand, Travel, USA and tagged flemming bo jensen, freedom, into the wild, nomad, nomad photographer, photographer, travel photography. Bookmark the permalink. 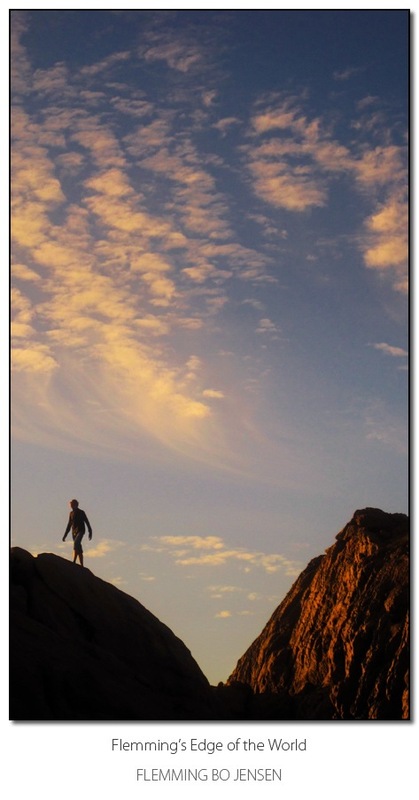 It’s me on the rock 😀 Great shot by my friend, this is at Sugarloaf Rock in Western Australia. A really engaging post, I enjoyed it. Hopefully we can catch up on your next trip to Australia. I love the photo ‘Open road to new horizons’ as well. Those red tones are amazing. Love it Flemming. I’m looking for a less tructured lifestyle myself. We’re planning an Aussie road trip leaving in a few months. Can’t wait! Hopefully I get some great shots on my travels too. No better way to practice! Hi Jo and thanks! And you’re right, no better way to practice than to get out there and shoot shoot shoot 🙂 I also owe you an email but I’m really short on time presently. Very interesting to read your inner thoughts hey. It’s funny, because when you’re working full time and think about living the dream one way or the other. You think it would be soooo easy! Go here, go there, do this, do that. What ever you want. But obviously there’s one thing not thought of as you have pointed out- and that is that those of us who are so used to that structured (rat race) kind of lifestyle will actually struggle for some time to adjust. Think at what you’ve managed to achieve even though as you have said- you were out of it mentally to some extent. You managed so much, and really achieved some incredible things- and this is just what we’re able to pick up through your images and stories. You are right that I now know the controls of this bloody tricky spaceship of mine 🙂 It will be bumpy as always but I’ll fly true. Thanks for the best wishes, see you in the Pilbara and yes, those Stirling Ranges are still a must too! I just finished your blog “Reflections…” and want to tell you that I am proud of you, Flemming Bo. I find my imagination wandering off with you and am filled with awe and great appreciation for your journey. You have gone where few dare to tred. You have experienced more in the last year than most people do in a lifetime. Hi Erin, thanks for your comment and visit to my blog. It is indeed a very different feeling, not the leaving part, that was easy for me, more the feeling of “wait why the heck is this so different to all my other trips, what’s happening?”. Nicely written account Flemming, when you finally settle you will have to write a best selling autobiography and fill it with great photo’s which I’m sure you have plenty of. Sounds like you are really experiencing life to the full to me. By the way India is a photographers dream but make sure you are fresh and lively when you go there because you will be worn out once you have been, It’s just full on. I had a gret time there but didn’t realise it until about 3 months later. Looking forward to your future tales and photo’s. Thanks for the tips on India. I have a friend there, but yes I have also been told that it’s very full on with so many people that I really must be fully charged. Will keep that in mind, cheers. Thanks very much for your comment and support Sandy. I guess I have done ‘something’, somethind different anyway. Feeling of failure is an old enemy of mine, sometimes a daemon sometimes a good ‘engine’. Awesome post. Eleven years ago I had the same ambition. I quit a 9-5 six figure corporate job to embark on a similar journey. No one – and I mean no one in my life – understood why I was doing it but I was responding to that inner pull. Looking back, I myself did not understand why I was doing it. The realities you spoke of were very true for me as well. I went through extreme emotional highs and lows, physical and mental fatigue, the best self reflection I have ever had, and ultimately a renewed spirit and appreciation for life. For me, after 11 months away, my journal and photography became a chore and the inner me spoke again and I knew it was time to go home. The one thing that my time alone did not prepare me for was the indifference about my experience I faced from the people in my life once i got back home. At first I was angry about this. But as you, I realized that there is no way for others who have not done this to understand that this was not some big vacation. It was work and honestly for me, some of the most real bit of life I have lived to date. Your posting is well timed for me. Working as a teacher now I am lucky to have summers off. I just got back from 6 weeks in Australia and unlike last summer 6 weeks in the Canadian Mari-times, I realized now how I failed by not keeping the “nomadic” life up. I really love that life. The fact that chapter two is set to begin for you in the coming months disproves you as a failure. This comes from one who has been there and would love to go back but circumstances now prevent that. What you are doing is special and amazing. Don’t be hard on yourself as you have won the battle and are living the life many would love to – even knowing and understanding the realities. I look forward to more pictures and posts! Two tips – if I may be so bold! First, I learned to plan vacations from my “vacation” to help get over the times it did become difficult. Especially after being in difficult places for extended periods of time. After two months in India for example, I spent three weeks in Europe to nest and re-charge. Second, do not end a chapter in India. As others have already mentioned, as rewarding an experience it is, it is still the most trying place I have spent time in the world. Your emotional swings there will be great and at times to get through a single day was more work than anything I had ever one in life. Having said that, it is the one place that still calls me back the strongest! One price to pay I haven’t touched on in writing is what you mention. That my frame of reference, my world, is now so far removed from almost everyone else’s that common ground can be hard to find. I chose this myself, just have to remember it when that feeling of total estrangement crops up. It seems that you really didn’t have a choice – you would have been damned if you didn’t go anyway. Coupled with your core self-belief and passion, these gifts should see you in good stead. Sometimes the hard and rocky places we fear when we are sinking turn out to be soft and forgiving and energising. I’m looking forward to reading about how things continue for you – except maybe the bit where you’re stuck on a boat with Christian and Mark in PNG and you can’t get away – the horror of that could be more than your readers can take! fantastic stuff. must get to meet you for drink sometime! Thanks very much! Will be somewhere in PNG, and somewhere in Asia again later this year.